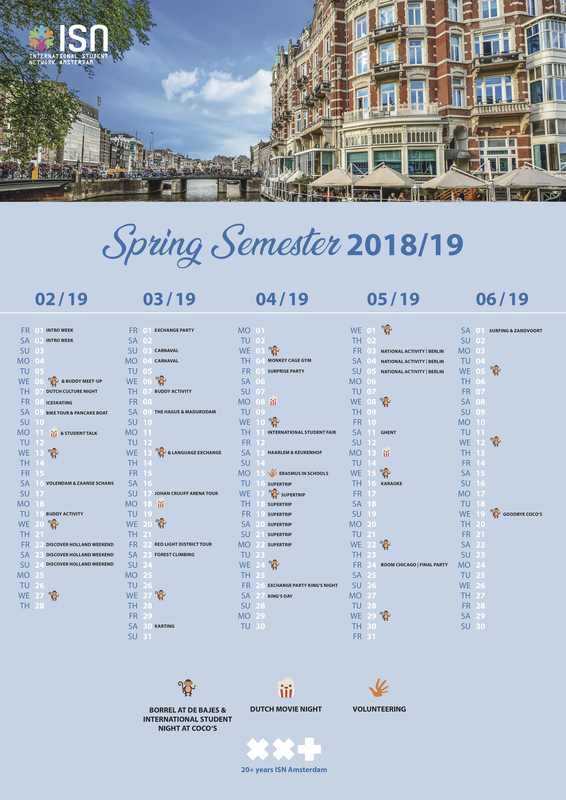 This page shows an overview of the activities in the upcoming spring semester. Trips: Carnaval trip, Volendam & Zaanse Schans trip, Discover Holland Weekend, Supertrip (to 3 large European cities), Rotterdam trip, Berlin trip, the Hague trip, and a trip to Ghent. Activities for the Buddy Program, Language Exchange Program, Volunteering activities (SocialErasmus, Erasmus in Schools), Theme Nights. Check our calendar, don’t miss out on our activities and note them down in your agenda! *NOTE: Due to the low prices, our events & trips always sell out! So we advice you not to hesitate too long when you are interested! More information about the event and the ticket sale will be announced in about one week in advance. For questions, please send an email to activities@isn-amsterdam.nl.